Over the Rainbow Artisan Soap, smells like....Raspberry, Blackberry, and Strawberries with Coconut Milk, Egyptian Vanilla and Amber Musk. Muted shades of Purple, Orange, Green, White & Pink make up this Hanger Swirled rainbow Bar, finished with a funky textured top. Weighs approx 5.5 oz, this listing is for one bar. All my soaps are small batch and are cured for a minimum of 5 weeks to ensure a milder bar. Cold Process Soap likes to be dry, allow it to breath and drain by using a soap dish between uses. 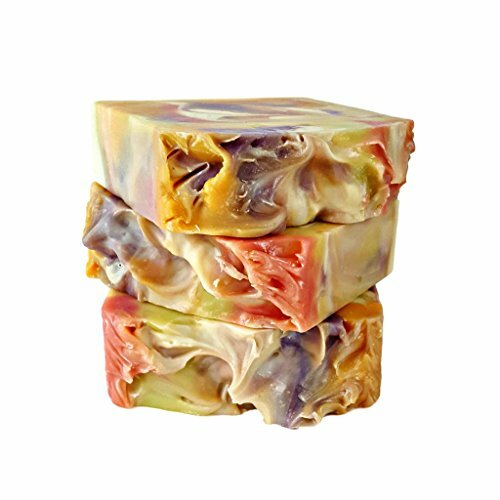 Soaps come wrapped in colorful tissue, labeled and packaged for safe transit. If you have any questions about this product by Riverbend Bracelet Co. featuring Sparkle & Splash, contact us by completing and submitting the form below. If you are looking for a specif part number, please include it with your message.